OK, I admit I’m totally off task today but I’ve chosen to continue the “lost” theme for the serial we started on Day 4 of Writing 101 rather than change it to “found”. My task is unfinished, it’s a 3 part serial after all. The little girl rode along the footpath near her home, not fast, just enjoying the day, which was lucky. She wouldn’t have seen it if she’d been in a rush to go somewhere but the leisurely pace meant she noticed the small oval item lying on the ground beside the path. She stopped, straddled the bike and reached down for it. A small medal showing detailed relief of a man carrying a small child on his shoulder. Clutching it in her fist she rode home and showed the housekeeper who told her it was a St Christopher, the patron saint of travellers. The idea of someone looking out for you as you travelled appealed to the girl and for several years she kept the medal safe in a box with shells and other little treasures. The time came for her to leave home and rather than abandon the medal with her childhood trinkets she put it in her wallet. It was with her when she lived in small country towns and when she travelled to large cities. It stayed with her when she travelled through small countries and across large continents until eventually it came back with her to Australia. As wallets wore out and were replaced the medal found a new home in the new wallet until the day an angry young man wrenched open a filing cabinet and stole the wallet. The medal was gone. My children were born in a hospital where midwives did the deliveries, a doctor was only brought in if there were problems. We lived in a small town which could be cut off from the city in bad weather so pregnant women were sent to the city on their due date. I’d been in the hospital for ten days, getting out of bed at 7:00 so everything could be made spick and span before the doctors did their rounds. No sitting on the made beds until after the doctors had left the ward. The sheer boredom of the day was only broken by meals being brought in and chats with the other women in the same situation. Because of the distance none of us were able to have visitors everyday so I was excited when labour finally started. The excitement didn’t last, it was replaced by pure misery. It was my first child and I had no idea how things would be. There were no antenatal classes where we lived and no pregnant women’s groups. Birth was just a natural part of life, thousands of women gave birth every hour didn’t they? It had to be simple but it wasn’t. After hours that seemed like a lifetime full of fear and pain I heard the midwife say to the nurse, “You’d better get Dr.Mackay up.” She sounded resigned to failure. When the pains were really bad I’d tried to use the gas but I didn’t know how and my hands cramped into claws. I’d tried to do everything they said, to push when they told me to push but they’d said I was doing it wrongly and I was just going to burst blood vessels on my face. I’d moaned, “Oh God” and the midwife had sharply told me “We’ll have none of that!” It went on and on until I thought they could just have the baby if they’d let me out of there. Set me free of it all. I no longer cared that I’d carried my child for 9 months and endured awful morning, afternoon and evening sickness. I just wanted out. If only they would make it all end. Then I heard those words and I knew things were going badly. From somewhere deep inside I found the strength I desperately needed. I pushed and pushed until my baby was born. The midwife said it was a girl and took her where I couldn’t see then I heard a tiny cry and relief washed over me. A white, porcelain doll with two little purple veins showing on her forehead was put into my arms. Like me she was fine, just exhausted. I felt I was the cleverest woman on earth. Perhaps if I hadn’t overheard the midwife’s aside to the nurse the outcome would have been tragically different. Throughout my childhood I lived in just two houses, one until I was six the next until I left home at twenty. Our house was old. Built in about 1900 from red brick, fronted with stone and when we moved in it was all original, the laundry, “bathroom” and kitchen. By the time I was twelve Dad had made improvements in all those areas. The front door had a heavy knocker and a weird contraption to open it. A small round handle was on the inside and it lifted a bar which allowed the door to open but there was a heavy old key too. The front door opened into the passageway which went the whole length of the house with rooms opening off each side. There were four fireplaces, a beautiful white marble one in a front room and a black marble one in what was our Dining Room. The other two were wooden with inlaid tiles. We only had a fire in the Dining Room and Dad always insisted the door be kept shut to keep the warmth in which meant in winter the rest of the house was very cold. All of the rooms had very high ceilings. Apart from the four big rooms at the front of the house there was a smaller bedroom and a very narrow pantry. There was a step down then to a porch area with bathroom and kitchen going off to the sides. How the rooms were used changed over time. When I was twelve my oldest brother had already left home but that still left my other brother, my two sisters and me so most of the rooms were bedrooms. The toilet had been updated from a “long drop” to a flushing one connected to a septic tank but it was still away from the house and I hated having to go out to it in the dark. Our yard was big! Big enough for at least a dozen different kinds of fruit trees as well as Mum’s ornamental plants, sheds and vegie gardens. We always had chooks but since my brothers went to an Agricultural High School we’d also had geese. I hated the geese. They were dirty and nasty. Very dirty and very nasty . We knew everyone all around from old Captain White, an ornithologist, to the newest immigrants who came from Europe for a better life in South Australia. When I was twelve, new houses were being established in the area which until then had been mostly market gardens. Today, on the site of our home, are fourteen, two-storey townhouses. What a different life it will be for the kids who live there now. In South Australia until 1967 pubs closed at 6 o’clock, so there was a “Happy Hour” of sorts between finishing work at about 5 o’clock and “last drinks”, especially on Friday nights. Dad didn’t go to the pub though instead he went to the Adelaide Central Market, a wonderfully vibrant place selling all kinds of fresh produce. He would arrive home with armfuls of paper bags filled with lovely fresh in-season fruit and the bags would all be lined up on the wall-length Kitchen Dresser. We could help ourselves, except for the bananas. My sister just loved bananas and they would disappear quickly causing arguments so Mum took to hiding the bananas. That sounds like a clever solution but it wasn’t because often by the time we found them they were over-ripe and no one wanted them. There were other food treats I remember. Mum used to make “mayonaisse” with a can of sweetened condensed milk and vinegar, we all loved to dip our fingers into the condensed milk and lick them. One year Mum decided we’d each get a tube of the condensed milk on our birthdays and we all loved it. I also remember finding threepenny bits in pudding and the worried looks before the last one was found. I think that must have been when our old auntie was living with us, she was a cook, Mum wasn’t. Another treat, for me, was fresh corn from the garden, cooked, covered in butter and eaten straight off the cob. Delicious. We had birthday parties and Christmas dinners but I don’t remember the food, Friday night fruit was what made me happiest. Great! She’s got the lead, not that I like the bloody thing clipped to me so I can’t go where I want but it sure beats being stuck in the yard all day. I suppose we’ll be heading for the Park again, plenty of exciting things in there if only she’d let me investigate them. We head off up the drive, you might think turning left at the top would be the best option it’s more natural but I prefer the path beside the railway line where I can check out who’s been past. The big, beefy Staffie who always stops opposite our side gate to crap and that infuriating red Cocker that must be insane the way it carries on every time it goes past. Of course I can’t get a decent read of the place, I just get the barest hint of the message and she’s pulling me away. She’s not too bad though, lets me leave my marker for the first few hundred metres before she just seems to get cranky about it for some unfathomable reason. Along the railway line we go then past the crappy Staffie’s house and into the park. It’s not a poncy park with mowed lawns and people sitting on wooden benches it’s really more just bush with heaps of intense smells. If I’m lucky I get to trail my nose through the weeds and stuff beside the track. Apart from all the other dog leavings I get to savour the wonderful whiff of rabbit and fox, if only she’d let me off the lead to flush the buggers out. The little lizards are much sneakier here than they are at home, disappear before I’ve even focussed and although I’d never admit it to her I’m quite pleased when she hauls me away from those antisocial hissers that seem to like sleeping out in sunny spots. The Galahs are always good for a laugh. They waddle along on their stumpy legs and fluff up their head feathers when they see me coming, as if that’s going to put me off. I like to force them to walk away a little bit then a little bit more until they get cranky and screech at me. At that point I decide to show them who’s boss but she always pulls me away and I hate the feeling they might think I’m some kind of pet, not free like they are. Sometimes we just go as far as the rocks and then come back the same track so I get to investigate a bit more but other times we go down to the gully. Telling you about that would take too long though so I’ll just stop here. You get the drift. It’s a nice day, not too hot and I think I’ll take Tilly to the Park. She’ll love it. I won’t go along the road, I don’t like it when cars zoom around the blind corner, much safer to take the Railway path. It’s great since Ken planted along here, the Lavender hedge is just gorgeous with all the flowers just now and so many butterflies. Lots of Cabbage Whites but Painted Ladies too. I just wish Tilly wouldn’t feel the need to sniff every single spot along the way and pee at every second bush. I thought when I got a female dog I wouldn’t have that problem. Some lazy, dirty owners have been along here and pretended they didn’t see their dogs crapping. Don’t they ever stop to think what it’s like for others coming along or poor Ken who has to weed here? We go along beside the railway then cross over the track and head into the Park. I love the sense of freedom I feel as soon as I step into it. Big Gum trees of all different types and Kangaroo Thorns which are some kind of Acacia, they protect the Fairy Wrens and I’ve even seen some kind of bright red bird like a Firetail Finch in here. The tracks are pretty rough and inevitably involve huffing and puffing up slopes but it’s worth it when we get to the Ridge Track. From here you can see the city spread out below. It’s not like most cities, there is only a square mile central core of high risers though a few more are popping up here and there. As we walk towards the rocks and memorial bench we disturb the Galahs feeding on seeds that have conveniently blown onto the track. We approach and they look annoyed as they waddle a bit further along the track then when we appear too close again they let out a screech, raise the feathers on the tops of their heads and flap their way down the track a bit. Sometimes they take a decent flight and we reach the seat before disturbing them again. I like to sit and take in the view for a while, count the container vessels lying offshore waiting their time to enter the harbour. Maybe one day my ashes will be sprinkled here in this wonderful, peaceful spot. We live here, we’ve lived here all our lives. I can’t remember the exact tree hollow that kept us safe until we hatched and fledged, there are so many around here that would have done the job. We don’t need a hollow anymore, well not until we start our own family anyway and in the meantime I like to hang out with friends. There’s quite a mob of us, all locals. It’s a good place to live. No cats for a start and plenty of space so no need for fights over food not that I’m saying we don’t fight over food! The grasses are covered in seeds just now and the best place to pick them up is from beside the tracks. Sometimes people come along with big noisy machines and cut the grass along the track but not this year, not yet anyway. People are the biggest hassle for us. Sometimes it’s mad people with black boxes strapped to their arms and they come running up the tracks with no thought for anything other than getting up a sweat. They don’t even stop to look around and enjoy the space. Then there are the cyclists, some are nutters that don’t use the main track, instead they find the hardest way down the hill and make their own track even bouncing about over big rocks. The other cyclists are a bit like the runners, they ride up the hills looking as though someone is behind them with a big stick. It doesn’t look like life is fun and they never stop to appreciate the trees, flowers, butterflies or even give us a second glance. Of course when they blunder up the hill we have to get out of their way, never the other way around. Dogs are another thing. What is it with dogs? They can never just walk on down the track and mind their own business, they have to pretend they’re savages about to rip us apart. For goodness sake, they’d probably choke on the first feather that stuck in their throat but they have to show off. Make us move from one spot to the other, it’s not as if they want the seeds. No, they just want to be annoying. Of course none of them can read, not the owners and not the stupid dogs. The sign at the front of the park says dogs have to be on leads and even has pictures but still they let the dogs run free. We let them know what we think of them, show them our rude feathers and make the most raucous, screeching noise we can just to irritate their ears then we move away until they realise they can’t impress us. When they give up their silly show we go back to the track, eat seeds and just get on with life. The task: Go to a public location and make a detailed report of what you see. The twist of the day? Write the post without adverbs. Today I was babysitting, I always like to be out and about so inevitably when I take on the role the TV is off and a walk is on. When my little grand-daughter and I returned from our jaunt today our road was blocked by numerous vehicles. We live in a hilly suburb with large areas of almost natural bush so wildfires are always a threat in summer. 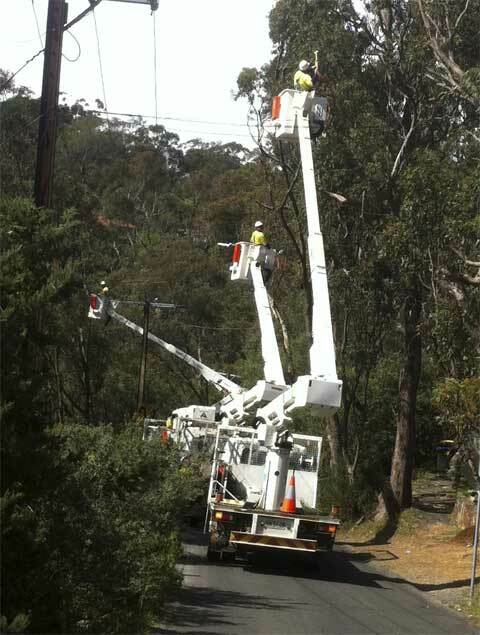 Because some past fires have been started by sparking of overhead powerlines tree trimmers periodically come around and cut back any trees likely to cause problems. There had been no notification so it was a shock to come back and find the street closed and our driveway blocked but it didn’t upset us instead it provided an interesting diversion. A battered yellow truck towing a large mulcher was stopped on the bridge over the railway line and behind that was a man with a “STOP/SLOW” lollipop pole. The spot is a “Y” junction so there was another person with the same type of pole at the end of the other street. Ahead of the yellow truck were three large vehicles with very tall, white “Cherry Picker” arms on them, blasé men were up in each basket with chainsaws. One of them yelled down that there was a pedestrian trying to get through. The supervisor came up to me and offered to stop proceedings while we made our way past the trucks to our driveway but I told him we were enjoying the spectacle. The trucks were big enough that all the action was safely ahead of us. Small branches were dropping like mini parachutes on either side of the road and I hoped that none of them had been supporting nests occupied by baby Magpies or Wattlebirds. The trucks inched up the very narrow road with the cutters yelling instructions to the drivers until eventually the yellow truck was almost up to us. The Supervisor said the noise from the mulcher would be painful so we took his advice and made our way down the road. Trucks were moved to give us access to our driveway and we went back down to the house. Curiosity got the better of me when the rumbling mulcher was at the top of our drive so we went part way up the driveway to watch the chips being spewed into the back of the truck. A worker used a leaf blower to blast the remaining bits from the road. I’m left wondering if there will be any entertainment like that the next time I’m called upon to babysit. Here’s hoping! The Writing 101 task today was to write a dialogue. I know the correct punctuation and manner of writing conversation but I’ve chosen to ignore it. My arm’s sore. I had an injection at school today. What do you mean you don’t know? You let someone stick a needle in you and you don’t know what it’s for? And you don’t know what it’s for? It was probably the Rubella vaccination. The conversation on that topic ended as abruptly as it started but walking out after the appointment he suddenly said. You had injections for STDs? You don’t need injections to stop you getting STDs! They last for 2 years. There is a much easier way to stop you getting STDs, just keep yourself to yourself! He smiled. No more was said but I’m still in awe of this little conversation that just cropped up between an innocent boy and his experienced old grandmother or should that be the other way around?